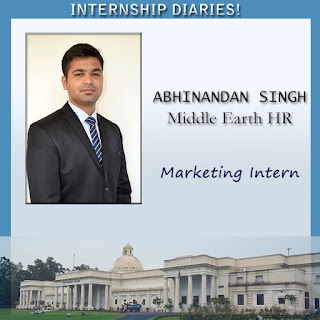 I had the opportunity to be intern at Middle Earth HR, a company working in field of HR and Leadership certification. The company is leader in Asia and ranks 7th globally in terms of candidates certified per year. The internship was in marketing domain under which I had to work on two projects. Major Being “Strategy and Implementation of social media strategy” and minor was “Analysis of communication channels for brand positioning”. While working on these projects I was part of a larger group of interns from reputed B Schools like IIM Raipur,NIMS,IMT etc. The focus was to make significant contribution not only through the individual project but also as a team to the larger project that we were assigned. For example the minor project was part of a larger project “Branding”, with each intern working on different aspects of it. The concept of two individual projects as part of a larger was unique in itself. Not only did it provide me an opportunity to hone my skills and be self-dependent through individual project but also gave me an experience of collaborating ideas and efforts for a larger goal. I was assigned a mentor with whom I could consult and take help in case of confusion. The mentor also reviewed my work before it was presented to the CEO in each weekly meeting. In case of differences in opinion every intern was given full discretion to justify his/her ideas rather than directly discarding them. Often a mutually agreeable solution was reached through brainstorming. While working on the major project I started with study of competitors to understand their industry specific use of social media for promotion as well as to gain customers .The study was followed by segmentation of customers and their frequency of use of different social media platforms. Also each platform was segmented according to the purpose they could serve. As the final outcome, strategy and roadmap was laid down for each platform which included calendar, targets and promotional strategy. The minor project required study of each communication channel through which the brand was being communicated to potential customers. These channels ranged from emails and website to certification programs being conducted. Each channel was to be analyzed for consistency of brand’s positioning. The final output was a list of suggestions for improving consistency of brand positioning along with analysis of existing setup. The best part about working in a stat-up or a small organization is the quick implementation of suggested ideas and access to CEO or top officials. I enjoyed both these benefits and thus I am content with the opportunity I got.